Play Sprint's Data Storm game for a chance to win a Galaxy Nexus | Android Blast! Sprint has launched a sweepstakes and will be giving away 30 Galaxy Nexuses. All you have to do is enter your email address in the web form for a chance to win a Galaxy Nexus. 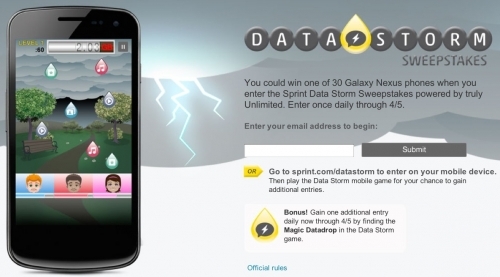 To improve your chance of winning, you can play Sprint's Data Storm game in your smartphone's browser. You could win one of 30 Galaxy Nexus phones when you enter the Sprint Data Storm Sweepstakes powered by truly Unlimited. Enter once daily through 4/5. The game makes fun of tiered data plans. You as a Sprint customer with truly unlimited data must help your friends gather data droplets after the data storm passes by. The sweepstakes runs until April 5.